I bought this artbook on Amazon and there are two things different from the description. 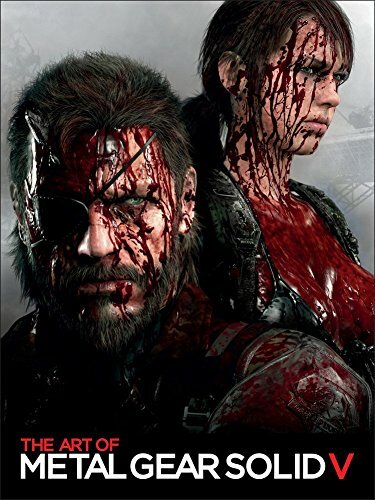 The book I have has 224 pages instead of the listed 184, and the cover art is of Snake with his metallic hand instead of the blood-soaked Snake and Quiet. This is a thick artbook packed with development art for the game. There are lots of designs for the characters, environment and props. You get to see familiar bold style of textures, black and white brush strokes used for character designs in earlier artbooks here again. There are also plenty of sketches, coloured concepts and the occasional 3D renders. Half the book is on characters. The mechas and other vehicles look great. One thing I like about Metal Gear Solid is their mechas really have that military feel. They are imposing and you can really feel the weight to all that metal. Weapons like arms designs are alright, not too different from the countless shooter games out there. There are several pages of prop designs, including the different cardboard boxes (lol). The rest of the book features environment art and scene paintings. There are also locations from Kingdom of the Flies which was dropped from the main game. The downside is there aren't any commentary or captions for the artworks. There are tiny handwritten Japanese annotations but they are not translated. I would have love to learn more about how the game was made and the design choices. Overall, it's a solid game art companion. Recommended to MGS fans.